The Nimslo is a lenticular stereo camera produced and released commercially in the early 1980s. The camera’s body is 137×74×43 mm (W×H×D) and weighs approximately .7 lbs. Most of its functions are fixed: The Nimslo has fixed focus and fixed exposure. The flash is not built-in. Instead, the Nimslo has a hot shoe for attaching a flash. Using 35mm film in 135 film format cartridges, the Nimslo can produce autostereoscopic prints, three-dimensional images that do not require any glasses or special equipment to view. To produce the 3-D prints, the film must be sent to a lenticular printer for processing. The camera works by snapping four conventional, two-dimensional photographs simultaneously, with each of its four lenses. Each image is 18 mm wide and 22mm high. There are two images in each conventional 35mm frame, meaning that 18 3-D prints can be made from a roll of 36 exposures (the photographs themselves are 3.5×4.5 inches). Each of these images differs only very slightly in perspective so that, when spliced together, they form one 3-dimensional photograph. This is achieved through a special printing process. The Nimslo uses a LED to put a green dot in the exposed film, which serves as a guiding point for the printer. At the special lenticular printer, the images are cut into vertical strips and spliced together, then laminated underneath a lenticular sheet containing prisms. The Nimslo camera and special lenticular printing process was invented by Jerry Curtis Nims and Allen Kwok Wah Lo of Georgia, USA. Prior to the Nimslo’s release, there was much excitement surrounding it. The camera was to be “the third major advance in photography,” according to the Nimslo corporation, after roll film and Polaroid technology. 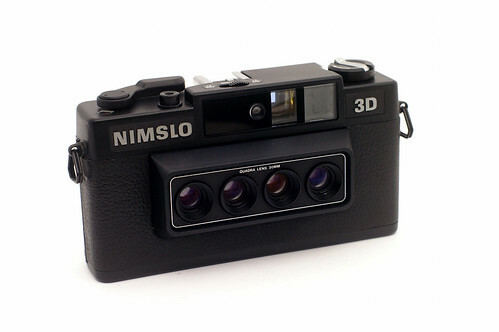 Two years prior to the release, a prototype had been demonstrated in Cologne, Germany, at the Photokina exhibition, and shortly before Christmas 1982, the Sunday Times read: “The euphoria surrounding Nimslo’s 3D camera once again reaches fever pitch.” Unfortunately, the camera sales did not do as well as the company and its investors had hoped it would. An attempt was made to create a cheaper variant of the camera. The German camera designer Karl-Heinz Lange was involved in this development. Nimslo Corp was partly sold in the 1990s to Nishika, a Nevada company that acquired the Nimslo patents, continued the Nimslo as "Nishika 3-D N8000" and introduced a three lens stereo camera. Today, Nimslo cameras are no longer available for retail sale, but can be found online on eBay. Currently, the only lenticular printer in North America today is Snap 3D, which is based in Canada.